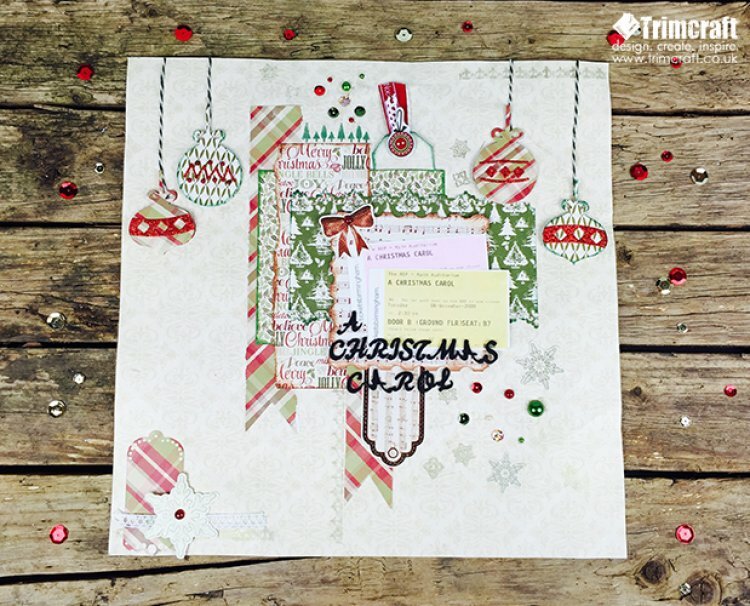 How to Scrapbook Tutorial Building Layouts without PhotosMemories can come in many forms from photos to leaflets and tickets from fun days out, in our latest edition we use old ticket stubs as our festive centrepiece. 1. Cut two strips of patterned paper from the Glad Tidings 8x8 paper pad which are roughly 3cm wide, use a ruler on one to rip the edges and on both cut a flag tail at the bottom. Adhere one around 8cm in from the left and put the other to one side. 2. Next cut out a 9 cm x 9cm square and adhere this over the strip using craft tape but leave an opening in the top right corner to slot a tag into later. 3. Cut another 4 cm wide strip of paper and layer over the square being careful not to cover up the pocket in the right corner. 4. Cut a 6x6 sheet of paper in half and punch along both sides with a lace patterned border punch and stick it across the page. 5. Cut out a large stamp nesting shape, take your saved strip of fishtail paper and add a glitter tag on top, layer under the nesting diecut before sticking it to the layout using 3d foam pads, mount your tickets into the centre. Top Tip: If you don’t want to use the originals then scan them into the computer and printed them out. 7. Using the A5 glitter stickers take one of the large tags and back it onto scrap paper and cut it out. Write your memories onto the tag before decorating it with ribbon and a 3D Sticker. 9. Glue four strips of twine down the page and then cut out four baubles using the die cut set from the Christmas basics collection. Stick these at the end of the twine using 3d foam pads, decorate with die cut glitter card centres and pearls. 10. Cut out a title using the Script Die set and black foam add around the ticket centrepiece. 11. Finish the layout by adding stickers and sequins around the page. Have you tried scrapbooking without photos? We think it’s a great way to show off and display your reminders of past events. Share you makes with us in the Project Gallery.